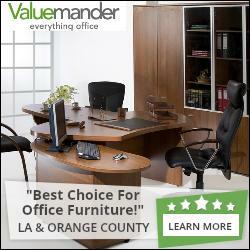 LA and Orange County office furniture store, Valuemander, has proudly announced that it is offering a wide range of new and used office furniture for businesses in the area. The online platform for authentic office furniture is getting a phenomenal response from business owners. Los Angeles County and Orange County office furniture store, Valuemander, has proudly announced that it is offering a wide range of new and used office furniture for businesses in the area. From cubicles to telephones or copiers to computers, Valuemander offers an extensive variety of office equipment that is available at highly affordable rates. Moreover, the online platform for authentic office furniture is getting a phenomenal response from the business owners who use it for buying and selling their office equipment of all kinds. “We buy and sell new and used office furniture and a lot of businesses from the Orange County have been frequently using our platform to buy and sell their furniture and other equipment.” Said the spokesperson of Valuemander, Sean Loftis, while talking about the platform. “We also carry a full line of new and used brand name cubicles, desks, chairs, file cabinets, conference tables, reception desks, lobby seating and much more to cater to our valued clients.” He added. In addition, the platform of Valuemander has a dedicated staff of professional experts who assist each buyer and seller at this one of a kind online marketplace for office furniture. Business owners love the convenience of this one-stop-shop, removing the hassle and headache of typical buying and selling office furniture. In addition, business owners have a wide range of high quality products to chose from. Whether downsizing, remodeling or simply accommodating a growing office, Valuemander can assist with everything you need. From copier machines to telephone systems, computers, electronics, printers, desks, chairs, cubicles, bookshelves and everything else related to office furniture or equipment is available on the website at the most affordable rates ever and this makes Valuemander truly a one of a kind marketplace. Customer service representatives are waiting to assist with everything you need!